Are you over 30 and dealing with adult acne? Or are you going through your teenage years and dealing with flare ups on a regular basis? If you responded yes to either of these questions, I have a solution for you. Teens are not the only ones suffering from Hormonal Acne. Many women think that acne is related to the teen years and hope those years are behind them once they become adults. Then all of the sudden acne starts appearing again and sometimes worse than it was during the teen years. Let’s face it; acne makes us feel self-conscious no matter what our age. And as adults, we desire to have flawless skin and feel young and beautiful. Once we understand the causes of hormonal acne, then we can work from the inside out to balance hormones and put the right nutrients in the body to reduce breakouts! During puberty, peri-menopause and menopause, sebaceous (oil) glands become more active. Pores can become clogged with sebum, dried skin and bacteria, causing skin to erupt into pimples, red blotches and sometimes inflamed and infected abscesses. Acne normally appears on the face, shoulders, scalp, upper arms and legs, upper chest and back. "I would like to say that after following the acne regimen that Angela was kind enough to email me for 3 months, my skin is completely clear! This has actually changed my life and my self esteem has improved greatly! Thank you Angela, you are a life saver!" "First off my hair and skin has never looked so good since I have been using your recommendations!!!" "I'm in my mid forties and you recommended I take EstroSmart for hormonal acne. I've been taking it for a month now (2 caps 2 times a day) and already see a noticeable improvement." According to a study published in the journal of Women’s Health done by Department of Dermatology, Harvard Medical School, Boston, Massachusetts acne today, acne is a problem for many women over the age 21. 12 percent of women ages 41 to 50, according to the study, conducted by researchers at Massachusetts General Hospital. Hormonal acne breakouts tend to occur during ovulation or the week before menstruation. In those women with hormonally induced acne, when the ovary releases the egg, it often is not able to completely release it. When this occurs, androgens (male hormones) are secreted in excess, and women develop acne around the hair line, chin and chest and back. To correct hormonal acne, many doctors prescribe birth control pills to stop ovulation. Today we have 12-year-olds on birth control pills to control acne. Nutritional supplements can normalize ovulation and eliminate the problem at the source. Even mild episodes of acne can lead to scarring, and scars can be both physical and psychological. While food choices have been hotly debated as a cause of acne for years, research out of the University of Colorado is confirming that a diet high in refined carbohydrates permanently boosts insulin and thus promotes acne. According to Dr. Loren Cordain, sustained high insulin levels elevate hormone levels, stimulating the production of oil that leads to clogged pores, bacterial growth and acne. High-glycemic foods such as breads, cakes, sugars and soda are major culprits in acne. According to a study published in the American Journal of Clinical Nutrition, a low-glycemic-load diet improves symptoms in acne. In 2006, Harvard researchers found that girls who drank two or more glasses a day of milk had a higher risk of acne than did girls drinking less than a glass a week. Although acne is epidemic in our society, it is virtually unknown in New Guinea and the Amazon where diets focus on fruits and vegetables. Those with acne should be conscious of foods that aggravate the condition. Acne is also associated with low stomach acidity, suggesting incomplete food breakdown and imbalances in the digestive tract. With the shift between male hormones and female hormones during the menstrual cycle, acne lesions change. Synthetic progestins and estrogens used for menopausal symptoms, supplements of DHEA, endometriosis, polycystic ovary syndrome and estrogen dominance have been linked to acne. Other drugs such as corticosteroids, anabolic steroids, iodides and bromides are also known to cause acne, as are cosmetics that block pores. "I am 29 years old and I've been taking Estrosmart Plus and Estrosmart since December 1, 2013. I suffered from severe hormonal acne (the kind where you don't even want to wake up in the mornings it hurts so bad), unwanted facial hair, lack of cycle, intense mood swings, painful swollen breasts, etc. Estrosmart Plus changed my life! It's been 5 months since I started using Lorna's products and my acne is completely gone, my cycle is 28 days every month, and my PMS is totally gone. I tried treatment after treatment for over a year and half before I found Lorna's products." So Ho Mish application in the morning and before bed as a night cream. Read more about So Ho Mish here. GLA Skin Oil taken internally once per day. Read more about GLA here. For Hormonal Acne, use EstroSmart daily. Read more about EstroSmart here. Use a quality natural cleanser with healing manuka honey before bed. Drink 12 cups of water per day. Drink only Reverse Osmosis filtered water. No tap water. Use natural make up products only. I recommend the Lagona Naturkosmetik brand. Take 1 tablespoon or 4 x 1000 mg capsules of Omega 3 from fish oil daily. This is a one month supply. Q - Since starting the Acne Protocol, I have noticed some acne along my mouth and jaw line. Is this normal? A - It is completely normal to have breakouts especially along the chin and jawline at the beginning stages of this protocol. This is a sign that your body is detoxifying the harmful disrupting hormones. I know it is frustrating to get even more breakouts, but after 2-3 cycles and your continued use, you won’t want to go back. It sounds like you are having a hormonal detox crisis, and these symptoms verify that you are estrogen dominant which is triggering your acne. You may want to consider switching to Estrosmart PLUS for a couple of cycles until everything normalizes. 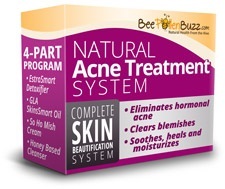 the plus part will help with acne (extra zinc) and also regulate your progesterone (vitex). It is also important that you drink a lot of water to flush and take a good multi-vitamin with minerals – make sure your multi contains vitamin A – it will also help. Finally during this time I highly advise a no white sugar, no white flour, pasta, bread, and no dairy products at this time. Especially cheese and milk – these can trigger flare ups. And keep alcohol to a minimum.